An international symbol of wartime sacrifice that is planted for its beauty and remembrance. This small, but brilliant poppy is called the Flanders Poppy. During World War I (1914 - 1918), the battlefields in Flanders, Belgium were so compacted and devastated by the war, that the wild red poppies stopped growing. After the war was over, the fields began to bloom again. 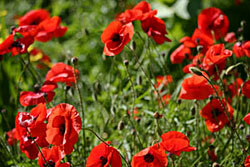 The flower was immortalized by Lieutenant Colonel John McCrea - a Canadian soldier and physician. His poem, “In Flanders Fields”, spoke of them as reminders of those who had lost their lives in war fighting for a cause that must be taken up by future generations. Scatter them in early spring for your own personal memorial, at the gravesite, and simply enjoy them for their glorious beauty and the memories of a beloved Veteran. With the gracious and enthusiastic collaboration of the Curtis Jones Family of their Botanical Interests company, each Military, Civil Service casket and the Cross will be accommodated by three packets of Flanders Poppy seeds.